At long last the Laughing Pig Flowers have arrived! 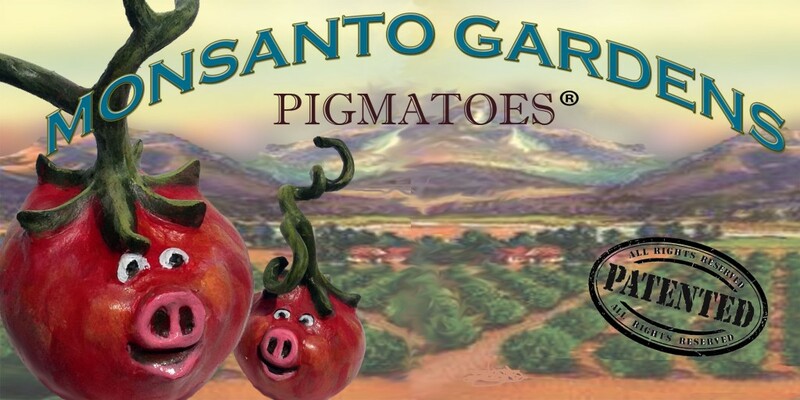 Together with an ever-growing host of pig-plant-human hybrids, including Pignome, Bumble Pig, Mr. and Mrs. Pigtato Head and Monarch ButterPig, they represent an uber race of genetically modified organisms developed by Monsanto Gardens with the express purpose of bringing joy to the world. 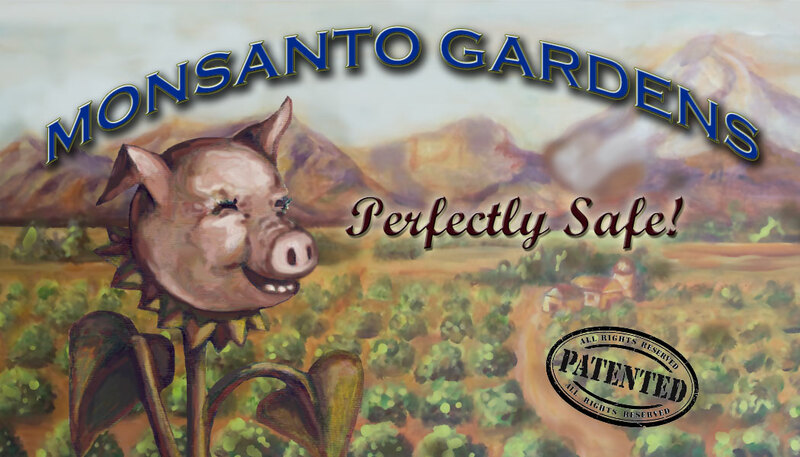 Like all Monsanto products, PiGMOs are RoundUp-Ready. Just pour RoundUp from the handy-dandy RoundUp Watering Can to eliminate all other life forms except organisms patented by Monsanto. It’s Perfectly Safe! Monsanto Gardens is a satiric art installation that explores the controversy over genetically engineered plants and animals. 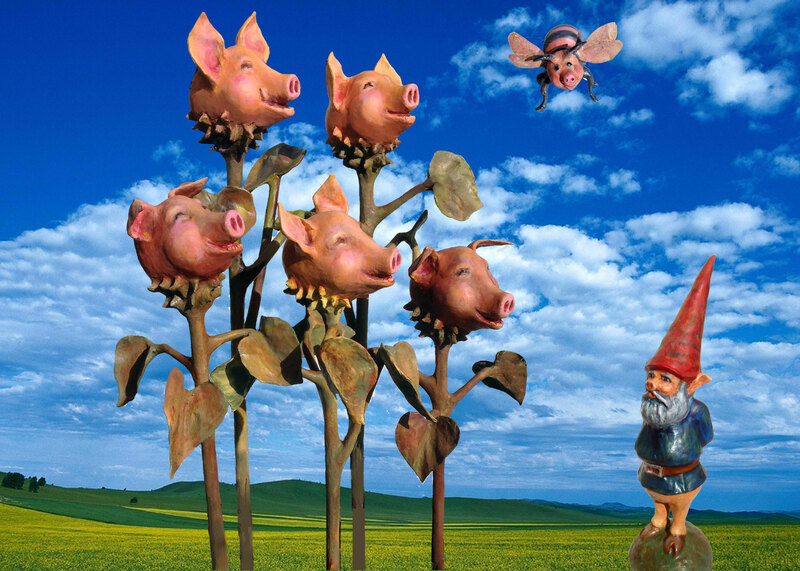 The installation represents a garden center featuring pig-hybrid sculptures (or PiGMOS) and other accessories (such as a RoundUp watering can, crates for PiGMOS, a tree stump, hay bales, a pignome, a bumble pig, a monarch butter pig, large bags of pigtatoes, sooey beans, and pigflower seeds, Mr. and Mrs. Pigtato Head, and a large banner). Five large pig flowers in pots range from 3.5’ to 5.5’ tall. Smaller tabletop items include 6 pigmatoes, 6 pigtatoes, 2 pigplants, and 4 pigmumpkins, 3 rudibacons, and four ears of bacorn plus Niblet. Some of the smaller items have are displayed in wooden crates with custom labels. More PiGMOS are in the works. All of the sculptures are made from 75% recycled materials including papier-mâché and air-dry clay. The garden center space will be defined by a carpet of astro-turf. I have created 4x4x2″ painted portraits of all the PiGMOs so far. I am planning large paintings to accompany the sculptural works, but they are not necessary to complete the exhibit if wall space is not available. Love the teletubbie feeling and that is one of the best garden gnomes ever seen. I’m glad you Like the one and on.y Pignome. 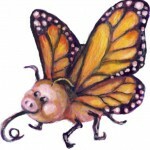 He’s responsible for tending the Laughing Pig Flowers and all the other piGMOs at Monsanto Gardens. I am sharing this with my food science and artist friends. Thanks so much Rachel! I am trying to find venues to show the installation. I think my students can get 2 credits for the paper mache project we are doing next week, but in addition, they have to do a small write up. I’m going to use your website as a reference for them. Now that I am experimenting myself with the medium I’m seeing your whole like through new eyes! The “recycled and inexpensive” element is especially notable since the school is comprised of most students in genrational poverty.